Little Tech Tips: google front page! 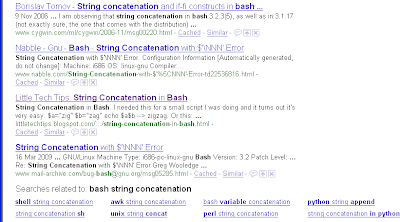 The admittedly simple post, String Concatenation In Bash, has made it to the front page of google when searching for "bash string concatenation." Here's proof. w00t. Not bad methinks. Not that I get a lot of traffic on this blog but I like to keep it going for personal satisfaction. :) And to save (and share) a lot of the little things that I learn along the way.